I am so grateful I got to meet Roger Ebert in 2009, when he screened Sita Sings the Blues at Ebertfest. He couldn’t speak then, but he stood onstage while his computer’s synthetic voice read his comments and looked intently in my eyes to make sure I was taking it in. He really wanted me to receive his gift, which was hard because it was so generous. Here is his longer review of Sita Sings the Blues, which brought many, many viewers to it. How swell. And, it was, as he said: “astonishingly original. It brings together four entirely separate elements and combines them into a great whimsical chord.” Interesting too to read your distribution plan, another astonishingly original conception, You are an astonishing original! R.I.P. Roger Ebert. He sure was a great man. I was one of those viewers who was led to SSTB by reading Roger’s excellent review; which then, in turn, led me to your blog. Thank you for your art and principled dedication to freedom from copyright imprisonment. Roger Ebert will be very much missed indeed, how wonderful was that experience you had and the gift he gave you! 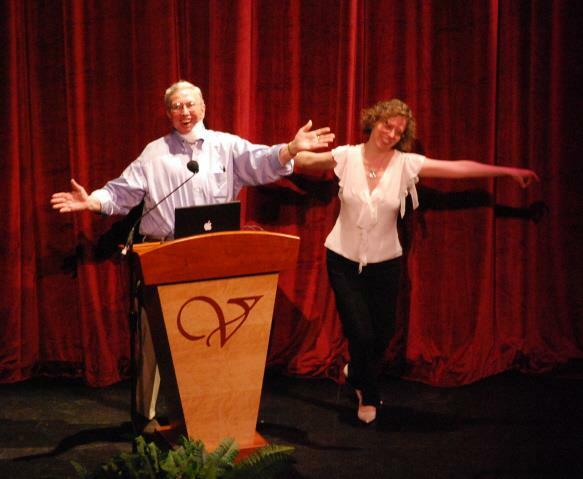 What a beautiful picture of you and Roger Ebert together, two of my creative heroes. I will miss his thoughts on future films, yours and the rest of the world’s. I finally saw SSTB last night (library DVD sign-out), and the only reason I knew about the film was Ebert’s review. Brilliant on both of you. I cannot say enough good things about the film!!!!! A sincere congratulations on your perserverance and outstanding outcome (as well as adopting that cutie Gray).